Television schedules in Japan are a very delicate thing. Timeslots are planned months in advance, and with the amount of cross-promotion this franchise does, everything has to be timed exactly. The episodes that promote certain games have to air the same week they come out, and the various captures / evolutions made by the main cast have to match up with the captures / evolutions present in that year's movies. Oh, Nintendo wants to release an Iwapalace C-Gear skin? Better make sure the episode in which Dent's Ishizumai evolves airs by then! The postponement of this two parter meant that everything else had to be bumped up two weeks. "The Hiun Gym Battle, the Pure Hearted Bug Pokemon Battle!," which was originally meant to air on March 31st, ended up getting pushed to March 17th instead. The episode after that was meant to be "The Hiun City Fishing Tournament! The Fishing Sommelier Dent Enters!! ", but that got skipped as well. So now, the show was three weeks ahead instead of just two. Once "The Fishing Sommelier Dent Enters!!" (notice the edited title) finally aired a few months later, the show went back to being only two weeks ahead instead of three. 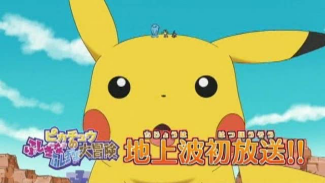 Now let's fast forward to October 20th, when TV-Tokyo aired one of the ANA Pikachu shorts ("Pikachu's Mysteriously Mysterious Big Adventure!") in Best Wishes' timeslot. The network had never done this before, so why start now? My theory is that TV-Tokyo only aired the short so they could close the two week gap caused by the "The Rocket-Dan vs. The Plasma-Dan" episodes being skipped. With this, the show was now only one week ahead. A baseball game aired on November 17th during Best Wishes! timeslot, finally getting the show back on track. New episodes of Pocket Monsters Best Wishes! air every Thursday night on TV-Tokyo, and new Pocket Monsters movies come out in mid-July. That year we had two movies, Victini and the Black Hero, Zekrom and Victini and the White Hero, Reshiram, both of which came out on July 16th. TV-Tokyo always airs the previous year's feature film the Thursday before the next movie comes out. So on July 14th, the Thursday before the Victini movies came out, 2010's movie Pocket Monsters Diamond & Pearl - The Illusionary Conqueror, Zorroark aired instead of a new episode. The skipped two-parter pushing everything ahead two weeks meant that the episode that introduces us to Luke ("Zorroa the Movie! The Legend of the Pokemon Knight!!") ended up airing on June 30th instead of its likely intended airdate of July 21st. If "The Rocket-Dan vs. The Plasma-Dan" had aired as planned, this movie-themed episode featuring the star of the previous year's film wouldn't have aired until after the Victini movie was already in theaters. The next episode, the one that started off the Don Battle arc ("Everyone Gather! The Don Battle!! "), aired on July 7th. We can guess that this episode was originally meant to air on August 4th. The second episode of the Don Battle arc ("The Fiercely Fought Don Battle! Tsutarja vs. Komatana!!") premiered on July 21st, 2011. But if the skipped two-parter had aired? We'd be looking at an August 11th airdate. There was no new episode on July 28th due to an hour-long Naruto Shippuden special airing during Pocket Monsters Best Wishes!' timeslot. This is normal; whenever a Pocket Monsters movie eats up Naruto's timeslot, the network will let Naruto take up Pocket Monsters' timeslot a few weeks later to make up for it. Based on the way the month of July plays out, it seems like the original plan was to have the Luke introduction and the four episode tournament air after the Victini movie, then have the show go on break for a week for the Naruto special, and then come back with the start of the Don Battle tournament on August 4th. The tournament would then go on to air once a week with no interruptions. But since everything got thrown out of whack with the earthquake, most of the Don Battle arc aired with this awkward two week gap between episodes. That's not a big deal now, but back at the time, having this tournament drag out for a month and a half was not fun. Luckily, dub fans didn't have to deal with any of this because the English version airs, more or less, once a week with no interruptions. TV-Tokyo's website shows previews for the following week's episode in a section of the website labeled kondo no o-hanashi (こんどのお話) or "Next Time." On that page is a box labeled kore kara no o-hanashi (これからのおはなし), or "Coming Soon," located right under the next episode summary. This box would give us a screenshot for the next two weeks' episodes, those episodes' titles, and a one-sentence summary of what's going to happen. My assumption is that since 2011's schedule was so messed up, TV-Tokyo didn't want to bother updating this section of the site anymore. It's like the people at the network are so afraid that something else was going to come along and mess up their schedule that they decided they didn't want to show us anything past what was going to air the following week. As of July 2012, however, they've gone back to updating this box. No idea why they waited so long or what changed their mind, though. It truly is amazing how much trouble these two episodes caused the schedule.